After arrival at Budapest Ferenc Liszt International Airport, you must think, how to get off here? Cost: 530HUF or day trip ticket. Traveling time: slow and depends on the traffic. Bus number: bus 200E +Metro M3. Pro: This will be the cheapest way for you to transfer from the Budapest Airport to the City Center ( Deák Ferenc tér). From the Deák Ferenc tér you will have an easy access to every Metro. Con: You need to change to the Metro line. If you have plenty of luggage or heavy luggage, then it might not be so convenient. 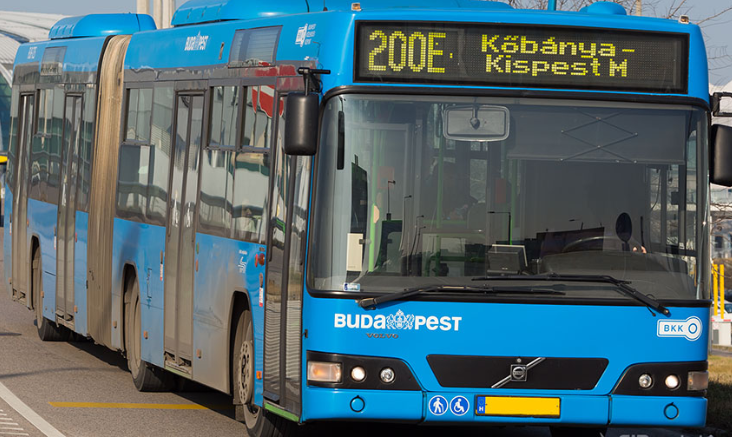 From the Budapest Airport take bus 100E(same big blue bus as 200E, don’t be confused by the looks), with one-way ticket 900HUF. The first stop is Kálvin Tér, near the city center, around the Central Market. From the Deák Ferenc tér you will have an easy access to every Metro. Pro: This kind of Budapest Airport Transfer is simple, easy and cheap. You only have two stops, you don’t need to change to the Metro and you will be in the city center in about 40 minutes. It’s also faster than public transport(200E) because it doesn’t have a lot of stops. Con: the price is more than a regular public city transport bus, and the days travel ticket can’t be used. In front of the taxi stop, you will see the minibus. And they will drop the place you want just like the taxi. Pro: Budapest shuttle can take you to your hotel or in front your house etc. and it’s cheaper than taxi. The mini bus won’t be too crowded and you’ll surely have a place to sit. Con: The traveling time might be longer then you think if there are other passengers also on board because the driver will drop every passenger, so the route depends on them too. It’s possible that you will be the last one. Cost: around 25EUR or more. Following the sign, you will find the taxi stop. You can get in the taxi there or pre-order one and wait at the same spot. Pro: you can go to your hotel or home faster and comfortable. Con: it’s more expensive, especially if you plan to go further then the city center. It’s highly recommended for you to order a taxi over the phone, or taxi application, because there are some freelancer taxies in Budapest, that will take you on a longer route than needed. The rental desk is around the terminal, with few companies if you didn’t pre-order. And the car will be just outside the terminal for you to pick up. Pro: you can drive to where you want, but remember follow the sign and the traffic rule! Con: take care when you drive! Any of Budapest airport transfers will easily lead you to our Dock 11. If you would like to enjoy the river cruise after you get off the flight. Regular BUS– get off at the Ferenciek tere, its one stop before Deák Ferenc tér. And from there, walk toward the Erzsébet bridge, then you will find our dock. Airport shuttle bus-get off at the final stop Deák Ferenc tér, then you can walk toward riverbank and see the Erzsébet bridge, and you will find our dock, or you can take M3 for one stop, get off at Ferenciek tere, and walk few mins as first one, then you will see our dock. Rental car – set the GPS to 1052 Budapest, Jane Haining rakpart, Dock 11, then you will be there after around 50 mins.